All Geckos Adventures tours, river cruises, expedition cruises, and adventure trips. Find the best guided trips and expert planned vacation and holiday packages. 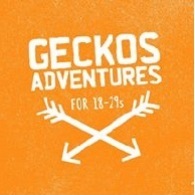 Average rating of 4.9 for all Geckos Adventures trips. Learn about salem's witching history before carving your own jack-o-lantern and getting lost in a corn maze. Get costumed up and take part in the village halloween parade through the streets of manhattan. Hear some of the spooky legends of one of america's oldest cities on a ghost tour through newport, rhode island. Visit the home of the headless horseman at sleepy hollow and take part in some next-level halloween fun. Get a sneak peek of bangkok and all its charging tuk-tuks, enchanting canals and dee-lish street food. Learn more about cambodia's confronting but important history, with optional visits to the tuol sleng genocide museum and choeung ek memorial. A homestay in rural chambok puts you right in the heart of everyday village life in cambodia. Need some time to chill? this trip has got you covered, with two days in sihanoukville, your launching pad to secluded island beaches and mangrove forests. There's loads of free time to make your own fun (flight of the gibbon zip-line anyone?) and have your own experiences. Your trip ends in action-packed ho chi minh city, the perfect place for a glimpse of vietnam.